The thoughts of our staff at American Opportunity are with those in Houston this week, as well as some brief thoughts on North Korea's impact on the Pacific economy... and MORE! First, I want to briefly remind you (as if reminders were possible) about the trauma unfolding in Texas and Louisiana as Hurricane Harvey drenches the region in a superstorm of historic proportions. Predictions of 40" of rain or more continue to hold true as the hurricane lines up for another shot that will plow alongside the Mississippi Delta before winding east, mimicking the same path Hurricane Camille took in 1969. My point of drawing attention to Houston isn't to remind anyone of the event itself, but rather to point towards the enduring optimism and small acts of heroism that stand in direct contrast to events that we have seen dotted across the country as self-declared "anti-fascist" mobs harass Americans with their own form of brownshirted vigilantism. Real anti-fascists build, they don't destroy. Mobs destroy. Hurricanes destroy. In a world where social media and the Internet seem to isolate and remove us from our own "little platoons" of community and family, the abuse and barter of our freedoms is inevitable. Examples such as the violence seen at Berkeley and Charlottesville abound, and it will be examples such as Houston -- and as Secretary Mattis reminded us last week, the selflessness and respect shown among our warfighters in Afghanistan -- that bring America back to common sense in the months ahead. On a similarly important topic, it is time to tell the truth about the need for a genuine and lasting tax reform proposal in the U.S. Congress. 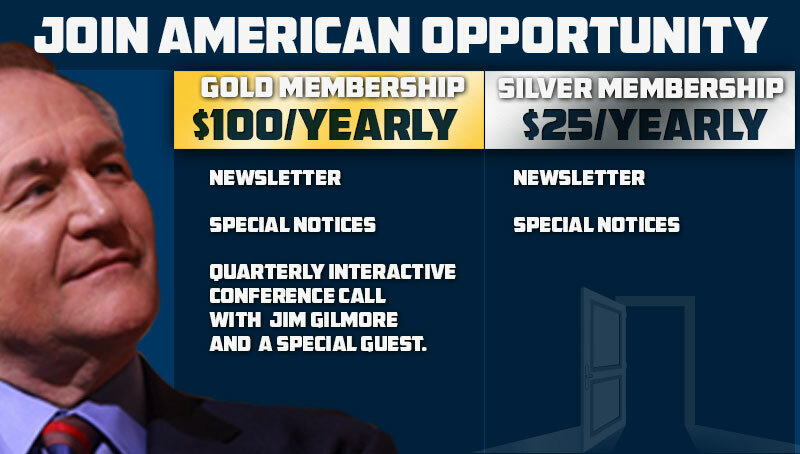 American Opportunity believes the national goal must be solid, sustainable economic growth. The American economy is presently growing at an anemic rate of 2%. This is not enough, and nowhere near our historic average of 3.2% GDP growth. The current U.S. labor participation rate in the U.S. is at a mere 69%, down from our height at 88% in post-war 1950. This drop is wasted labor -- never engaged -- which leads to lower growth and fewer opportunites for our children and grandchildren. Growth can be encouraged by a good tax reform bill, which we will discuss more in the days ahead. Opposition to true tax reform will undoubtedly beat the same tired old drum: "This is just tax cuts for the rich". NO! Tax reform is desperately needed to spur American investment which leads to greater productivity for workers, growth within the U.S. economy and a far better standard of living. A tax reform bill is urgent -- the missing piece -- to finally recover from the lost years of the Great Recession; one that rewards hard work and encourages Americans to rejoin the working class our fathers and grandfathers understood an American economy to represent. Please go to our web site to read American Opportunity's Growth Code plan. Our proposal is in line with the president's program, and what's more, this economy urgently requires the sort of positive, lasting, and durable tax reform the Growth Code provides for generations of Americans to come. North Korea seems to be a perennial topic, especially as the markets took a deep breath early Tuesday morning before exhaling this afternoon. As the Trump administration begins to consider tougher sanctions against North Korea, keep your eye on which sanctions will be leveled against the Chinese government as well. China's influence on North Korea is immense, and if they so chose, the Chinese could instantaneously compel the North Korean government to stop meanacing the region. To date, China has shown a great deal of reluctance in restraining North Korea. In fact, an argument can be made in the light President Trump's concerns about Chinese currency manipulation that North Korean intransigence is more causation than correlation. Perhaps the Chinese are placing a bet that President Trump does not have the support back home for any serious decisions, either to cage North Korea or send a message that China's peaceful rise will not be underwritten by the American taxpayer. Both assumptions are foolhardy at best and myopic at worse. This is a president that will act if required; the United States military will not be bullied or pressured into making a decision on North Korea's timetable. So long as nuclear non-proliferation remains an imperative of American foreign policy doctrine, North Korea's ability to project force will be limited, short-lived, and fatal to the Hermit Kingdom if pursued. China is not immune to security concerns either. In Hong Kong, the government is facing pro-democracy activists. In India, a recently defused border dispute could flare up at any time. In the Xinjiang province, civil unrest is a reality. In the South China Sea, several nations have security concerns as Chinese naval assets continue to assert themselves. China's list of allies and options wears particularly thin... North Korea would only serve to be an additional -- and nuclear -- addition to this list of concerns. One misplaced bet on the part of the Chinese is the perceived hesitancy of the United States to jeopardize our economic recovery during midterm elections. In this regard, the Chinese have far more to lose than the United States, as their own housing and infrastructure bubble cannot maintain itself forever. Once capital flight becomes a serious consideration, it will be the European Union and United States that retain a position of strength. Conflict along the Pacific Rim would make capital flight a very real security concern for the Chinese government... hence the low-stakes game of "chicken" over North Korea when it comes to the Trump administration's readiness to crackdown on currency manipulators. This is all the more reason that American diplomacy must exercise a careful balance of firmness and patience, and why our South Korean and Japanese allies must have the full assurance of American military support. As we have seen over the last few days, North Korea's efforts focus entirely on getting the pendulum of fear rocking. Only firm American leadership can prevent this gambit from being successful. Reinforce skittish markets and defuse tensions along the Korean peninsula should remain our primary focus, and a firm and patient resolve should forge our strategic decision making moving forward. Marginal Revolution: The Conservation of Coercion?